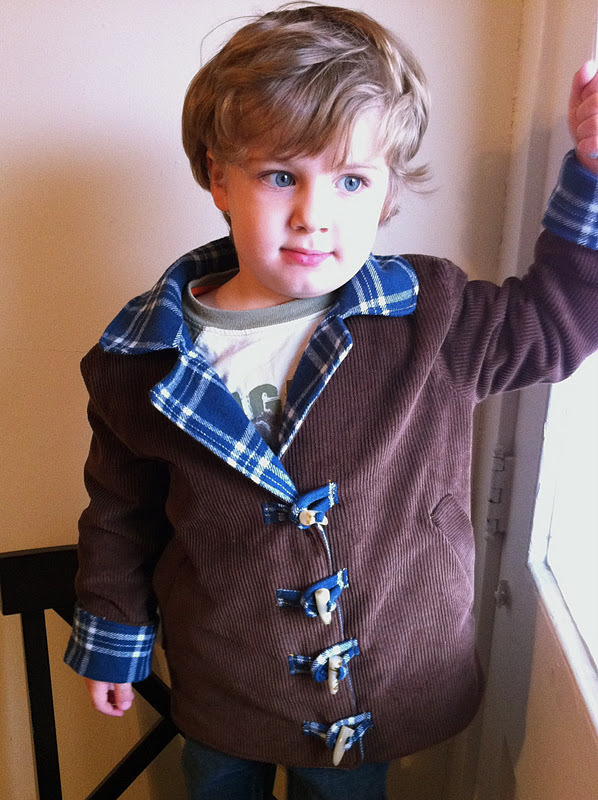 It's January 21, we live in Ohio, and my 2yo finally just now has a coat. This project just kept getting pushed back all winter. I've had the fabrics for a long time, so I didn't want to buy him a cheap Target coat when I had already spent the money on this. I just had to make it! Tara's sew-along gave me the push I needed and the sewing guilt has been lifted. Luckily, winter didn't really arrive here until this week. So now that he has a coat, I'd rather just stay inside, thank you. 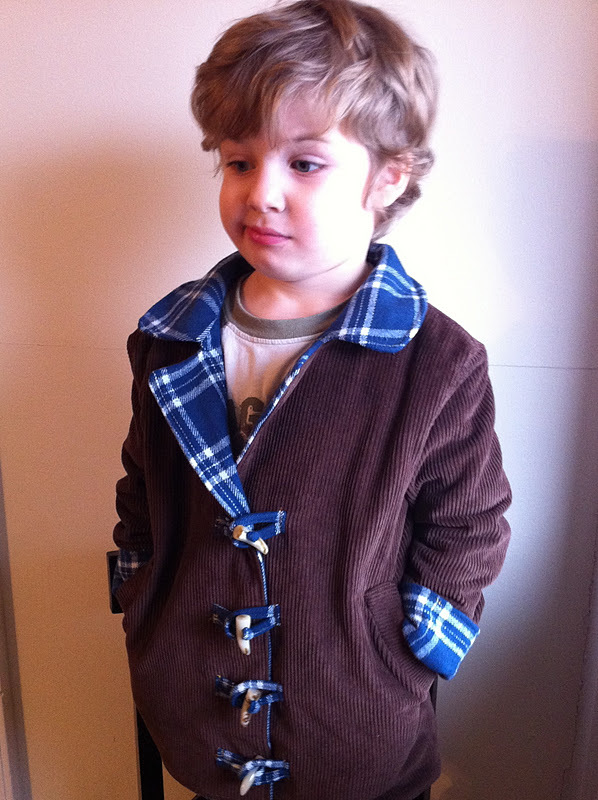 The outside is a wide corduroy and the reverse is flannel, both from Joann's. Once I started sewing, I really wished I had found some better corduroy. This one just feels chintzy and I'm not in love with the shade of brown. But I'm just nit-picking, overall I'm really happy with it. I made the side 4/5 since he's wearing 4t now, and I think it's big enough that he'll be able to wear it next year too. I interlined the front and back pieces with an extra layer of the flannel for warmth. My favorite part is definitely the toggles! I couldn't find any buttons that were right, but I didn't want to take short-cuts on the details. So I ripped these off an old baby jacket of his, thinking this would be a quick solution with high payoff. Well, the payoff was good, but it was not quick or easy. First I had to make a bunch of those tiny cords out of the flannel, making sure they were rolled tight with all the raw edges inside. Then I had to jam them thru the tiny holes in the toggles. This was a lot of tedious work. I've never used my teeth so much in sewing. Of course, now the jacket isn't truly reversible like it's meant to be in Sewing For Boys, but I don't think I would really reverse the sides often anyway. The toggles make the thing. This was a great pattern to follow and I really enjoyed tackling those welt pockets. (Not as hard as you would think.) After my experience with this and the raglan tees, I cannot wait to make more from this book! I LOVE that blue plaid with the brown. So unlikely, but works a treat! So Cute!!! Great idea for the buttons! Thanks so much for sewing-along with me! Your participation and comments were such an encouragement. 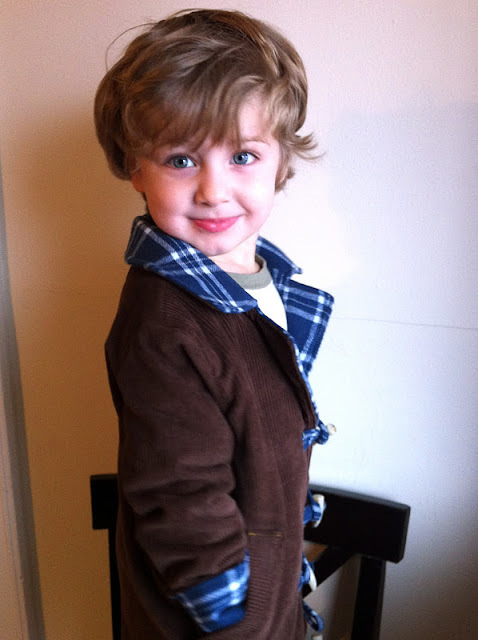 I love your jacket and your adorable little model! he is so adorable! i love his modeling and you are amazing! i am soo soo impressed! excellent sewing skills jessica! Look at him! What a cutie. Great idea to add the toggles, too, they're perfect. I love how it turned out! I'm totally digging the blue flannel and the toggles look fabulous. That is sooooo cute! I got that book for Christmas and have been eyeing that pattern. I'll have to try it out! Like I said on flickr, that first pic is just over the top adorable. He's such a cutie! And the jacket is awesome. 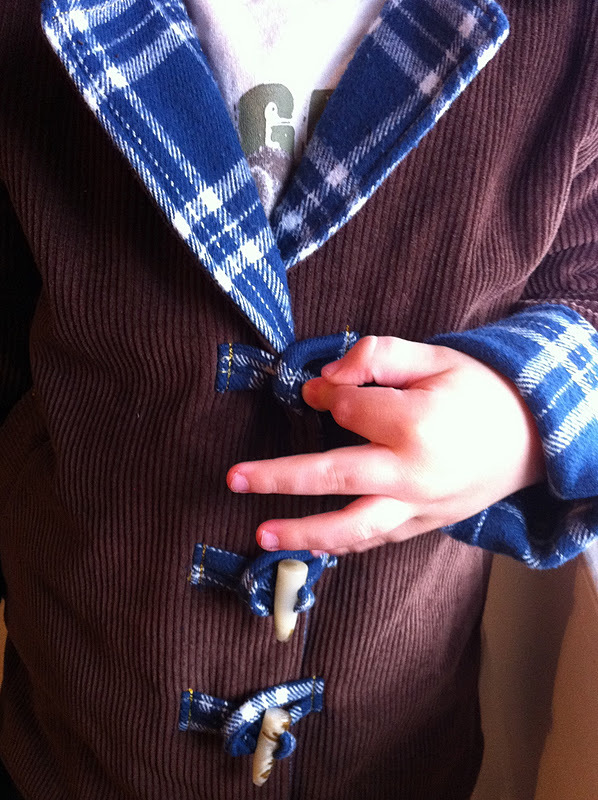 I agree that the toggles are the best part. So impressive! Wow! 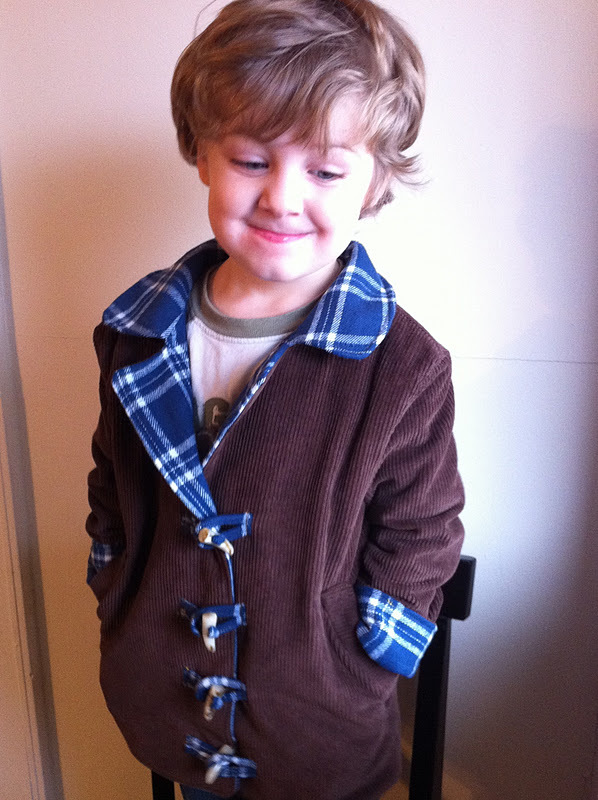 So cute- both jacket and model! Oh my, you're right - his moves were rocking this time. Make sure no kid-model hunters see this! Congratulations, you won my little giveaway! Thanks for being a part of it, it was so nice to know I had someone sewing with me! Please send me your info when you get a chance and I will get it in the mail soon. hey, did you have to adjust the pocket position ? i found it didnt work for size2/3.